Podere Vignola farmhouse is located in the heart of Tuscany, just 10 Km from Florence, in a small and hidden valley on the sweet hills of Chianti. Podere Vignola is surrounded by a wide park with swimming pool and has 5 wonderful self-catering apartments finely furnished and endowed with all the needed comforts. The apartments are ideal both for summer and winter stays. Each apartment has direct access from the garden and is provided with a veranda for lunches and dinners in the open air. Podere Vignola is located in the immediate vicinities of the wonderful Florence and of its astonishing museums, art galleries Churches, haute couture shops. Apartment Fienile is a 90 square metres flat that has a double bedroom, a bedroom with two single beds, two bathrooms, a living room with open kitchen and two terraces. This flat is suitable to accommodate up to 4+2 people. 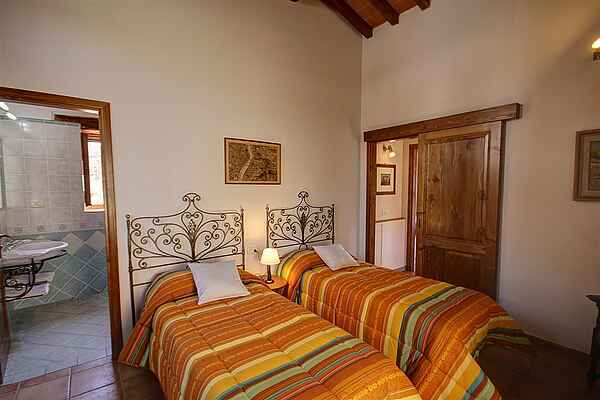 Podere Vignola is the perfect choice for those willing to visit Florence and other places in Tuscany. It is close to Florence but we suggest to our guests to have a car. It is very convenient to go to Florence by train since it is very expensive to park the car in the historical centre of Florence but the closest train station is 1 km far Podere Vignola (Sieci train station). Swimming pool opened from June to September.